Donations may take 24-48 hours to be reflected above. Donations are securely processed by PayPal (and no, you don't need a PayPal account to donate!). Amateur Radio operators who donate will receive access to special featuress of our radio repeater! What a difference a year and a half makes! 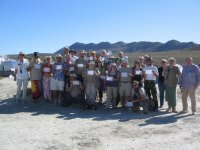 By the end of 2009 -- when we last asked for your money -- we had set up our "ham radio base camp" in Gerlach, Nevada: a UHF repeater, UHF and VHF IRLP nodes, and an APRS digipeater. The installation in Gerlach provided Amateur Radio voice communications and GPS position reporting both for convenience and public safety. Whether you're were just trying to find your friends camping on playa or were desperately seeking help for someone lost or injured in the desert, the Black Rock Amateur Radio Association's radio resources are there for you -- 24 hours a day, 52 weeks a year. 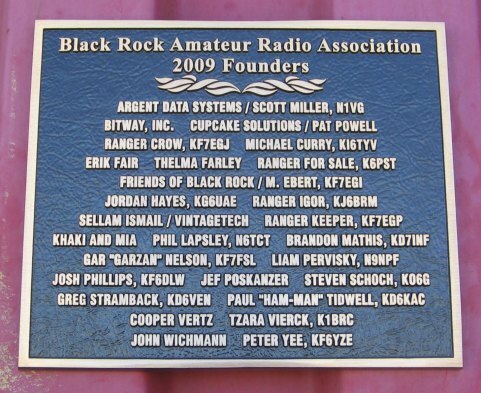 It formed a solid foundation for Amateur Radio in the Black Rock desert. In the 18 months that followed, we've built like crazy on that foundation. Phil, N6TCT, and Michael, KI6TYV, working on the new repeater in the mountains high above the Black Rock desert. 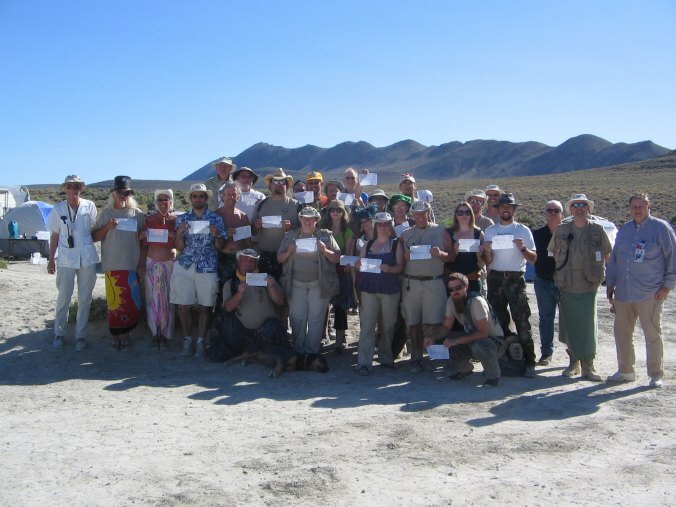 We're looking to raise $5,000 by the end of the year to support our current and ongoing efforts to improve and expand the footprint of Amateur Radio in the Black Rock desert. 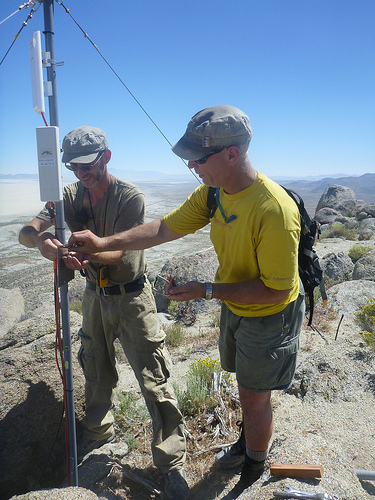 Securing a lease with the Bureau of Land Management for a mountaintop repeater site overlooking the Black Rock desert -- a vantage point that significantly improved our repeater's coverage. Deploying a solar-powered UHF radio repeater and APRS digipeater at the site. Our mountain-top site is inaccessible by vehicles, so this necessitated five trips over the course of three days to lug solar panels, a deep-discharge battery, radios, and other equipment up the mountain -- on our backs, dripping with sweat each step of the way. But it was worth it: as a result of our new location, you could communicate from virtually anywhere in the Black Rock with just an HT. 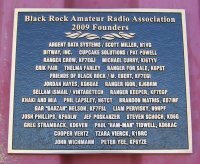 The BRARA Founders Plaque at our Gerlach base camp. Improving our Internet infrastructure. Our mountain-top solar site has a high-speed wireless data microwave connection back to Gerlach, some 15 miles south. In Gerlach, our radio and computer setup now features multiple backup radio links on different frequencies. The result is that our emergency phone patch, IRLP, EchoLink, and APRS connections are more reliable than ever. Our new repeater did a great job for the attendees of the 2010 Burning Man event, as well as for hunters, campers, amateur rocketeers, and other users of the Black Rock later that fall. But we weren't satisfied. In early 2011 planning for "version 2.0" of our repeater began in earnest. In May 2011 we hiked the mountain again, this time to deploy a next-generation repeater with significantly more functionality (e.g., EchoLink) and on a frequency that is less likely to experience interference. Happy graduates from our first ham cram and exam! The upshot of all this? We've made a heck of a lot of progress. It's been a heck of a lot of work and a heck of a lot of fun. But it's also cost a heck of a lot of money. Please take a moment to scroll up and look at the donation levels to the right, choose an amount, and then make a donation to the Black Rock Amateur Radio Association. We're counting on your support. P.S., We're still waiting to hear back from the IRS regarding our application to establish our status as a 501(c)(3) tax-deductible organization. We will let you know as soon as we hear something.